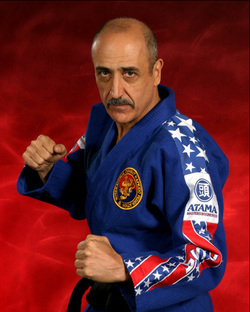 In 1990 Grandmaster Pellegrini officially named his style of Hapkido 'Combat Hapkido'. The name clearly identifies it and sets it apart from other 'traditional' styles of Hapkido. It is also referred to as the 'Science of Self Defence'. Combat Hapkido is an extremely realistic and versatile discipline of self protection that includes an extensive variety of strikes, kicks, joint locks, pressure points, grappling and disarming techniques. The result is a practical, comprehensive Self Defence system that is enjoyable to learn and that produces effective results in realistic situations. Combat Hapkido’s dynamic concepts are based on scientific principles of anatomy and biokinetics as well as psychology and strategy. It is well suited for men and women of all sizes because physical strength and athletic abilities are not essential. The emphasis is on redirecting the assailants’ aggression and power back toward them with little effort and minimum force. Founding this system did not involve 'inventing' the techniques. It was a matter of selecting the most realistic, effective and practical ones, modifying others and then combining and arranging these techniques in a structured system of instruction designed for individuals of all physical abilities living in a modern society. Combat Hapkido is for sincere and open-minded students and Instructors who are serious about wanting to grow and evolve to a new level of understanding and ability. Combat Hapkido is also for those individuals who do not have the time, desire or ability to commit themselves to the demanding study of a traditional Martial Art. The essence of Combat Hapkido is pure Self Defence. It is the synthesis of dynamic concepts, scientific principles, realistic applications and plain common sense. an amateurish mix of random techniques from different Martial Arts. Combat Hapkido can be easily integrated into any program because it compliments and blends well with most Martial Arts. Combat Hapkido is 100% Self Defence. There are no forms (Kata/Hyungs). Combat Hapkido does not teach 'acrobatic' kicks. Combat Hapkido does not teach 'Traditional' weapons like joot-do (bamboo sword) or fan. We teach cane, belt and other Self Defence tools. Combat Hapkido contains a complete Ground Survival program. Combat Hapkido is not a sport and cannot be modified nor regulated to be one. There are no competitions, tournaments or championships. Breaking boards (or any other material) is not required nor desirable in Combat Hapkido.